Kenya is going through it’s second major election cycle. It has been 5 years since Mwai Kibaki was elected and Kenya is facing a test: can it have another free and fair election? December 27th (tomorrow) is the big day. Media Focus on Development have created a full multimedia campaign, anchored by TV and radio shows, that use SMS messaging and the website as key touch points. I found the SMS surveys to be quite interesting. The questions were posed by the TV and radio personalities and people were asked to text in their simple “yes” or “no” response. TV and radio have a much greater reach in Kenya than the web. Using these traditional media conduits as the anchor for their campaign is smart. I would be really interested to hear the numbers on how many responded to the questions. Did the campaign reach enough people to be significant? Of course, any mention of technology being used to monitor and report on the Kenyan political scene would be incomplete without mentioning Mzalendo. Created by Ory and M, two well-known Kenyan bloggers, Mzalendo is a usable database of information about politicians and their constituencies that any Kenyan can report into. I’m still trying to find out if there are any organizations doing any type of mobile election monitoring, akin to what we saw in Nigeria using FrontlineSMS. If you know of any, leave a comment or email me. We will be publishing an extensive guide for civil society groups, together with NDI, on how to monitor elections using SMS in the new year. Thanks! All the best, Katrin [at] mobileactive [dot] org. Not sure about the sms thing, but fair and free elections are doubtful. A friend of mine was not able to vote here in Nakuru due to the fact that the polling location did not have the book with the “O” names in it. 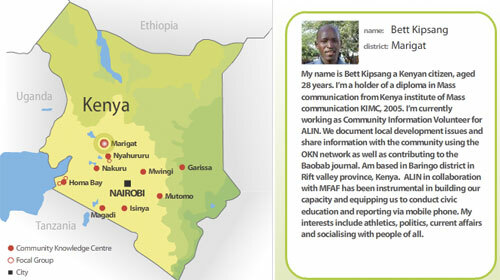 We – Media Focus on Africa Foundation – Kenya/Netherlands (MFAF)- are very happy with this interesting feedback on our work. MFAF is also glad to have found AfricaNews.com prepared to not only host but also enable us technologically to realise this project as part of our ‘Kenyan Elections Campaign’ website: http://www.mediafocusondevelopment.com. However Media Focus on Africa/Kenya has conceptionalised and implemented this innovative new media component on the ground as part of their far more extensive cross media ‘issue based’ communication strategy supporting ‘Free and Fair’ Kenyan elections. This on behalf of the UNDP Election Assistance Programme and Development Partners. Our mobile phone programme ‘Voices from the Arid Lands’ aimed to reach out to and engage the Pastoralists living on the Kenyan ‘arid lands’ in other ways (due to lack of electricity) into our electronic and print media campaign. This campaign was mainly based on creating media platforms for debate on radio (386 programs over 12 stations) and 30 TV shows over 3 stations, a nation wide Bill Boards and SMS campaign. What a disaster these elections are turning out to be. If only even a little of that technology was accessible to Electoral Commission of Kenya (ECK)! But alas the commissioners are too old ( at one point the ECK chairman said he was unable to make outgoing phone calls from the landline in his office! even though incoming calls were still being received. More likely he didnt know how to use the phone). The ECK chair also said Returning Officers ( the VERY TOP officials in charge of voting in a constituency with the unilateral powers to declare winners in paliamentary ballots–see http://en.wikipedia.org/wiki/Returning_officer) had [deliberately] switched off their mobile phones and could not be reached before reporting any results to him and this like 48 hours after polls closed!!!! The absurdity is beyond belief. They also seem to believe the only way to ANNOUNCE results is to READ them out to the media. The only unfortunate thing that happened is the media blackout that the government enforced which shows how media independence is vulnerable to autocratic governments. In those SMS polls, was there a mechanism for preventing multiple votes by the same user? (I am recalling the SMS and Web survey on the “Seven Wonders” last year in which “vote early, vote often” was not only technically possible but encouraged, especially by local boosters here in Brazil.) If not, then in what way can those polling results possibly be of genuine interest? I recently noticed a Web survey on the ECK Web site, for example, that asks users for their opinion about the possible causes of multiple registration (one voter with credentials allowing them to vote multiple times). I was able to vote in that Web survey multiple times. I am not a Kenyan, by the way. 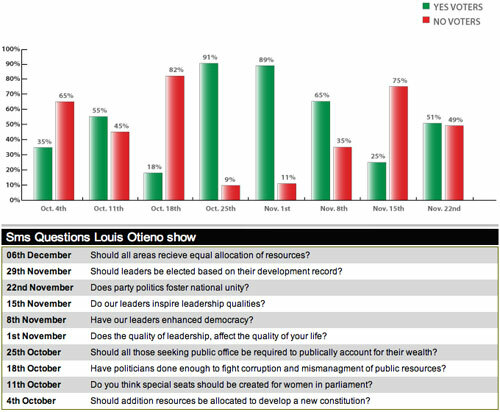 FrontlineSMS wasn’t used in Kenya, although there was interest in how it could contribute in the election process. I just wanted to comment though on the whole issue of citizen monitoring since many people seem to completely miss the point. Election monitoring has been going on for decades – official monitors (often, it seems, appointed by the international community) keeping a watchful eye on events. The recent trend of mobile usage in official monitoring is clearly an exciting one, but in this particular instance it can be seen as introducing a new tool to an established practice. Citizen monitoring, however, is a completely new ball game. Mobile phones are allowing an entirely new audience – civil society in this case – to engage in a process where they have traditionally had no input. It may be less structured or systematic, but it does empower the voting public, and engage them further in the political process in their own countries (whether or not their input is ‘valid’ or technically sound). Nigerians certainly felt empowered by the process in April, even though the election was widely reported as being unfair and corrupt. There may, of couse, be concerns over the accuracy or impartiality of information coming in from citizen monitors. While this is valid, it shouldn’t be used to argue against its overall value. Citizen journalism clearly has the same issues (we rarely know much about the individual reporting the event), yet very few people seem to worry about that. As I mentioned in a Blog post after the elections in Nigeria in April, a great part of the work has to be citizen empowerment – official monitors using phones is great, and it may allow more to be posted around the country, but this does little to engage wider civil society. And that’s where the mobile phone is potentially at its most powerful. I am currently writing a class work on empowerment of the poor through ICT (Information and Communications Technologies) transfer in East Africa. My aim is to promot the inclusion of the excluded of societies, empower them to contribute to the life of thier nations, communities and families. I beleive today’s telecommunications technology is offering a unique opportunnity for the poor to join in, contribute and mostly benefit from national and even global development. However, I suspect that big companies who own today’s global economy might not be willing to join inthis as it might represent some loss for them. But what can the common people (middle class in Kenya, Uganda, Tanzania, Rwanda, Burundi, USA, UK, Japan…) do to help? 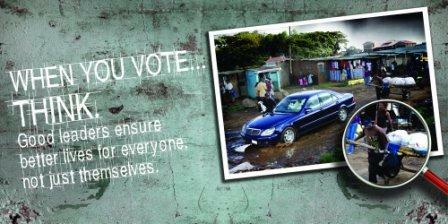 Global Voices Online » Kenya Elections 2007: Should Raila Supporters Celebrate?